I love coming up with maps, I love figuring out the history of a world. Regardless of if you do your worldbuild from a top-down, bottom-up or concept-out process, to some degree you have to figure out A. the physical space and B. the backstory that leads up to the "now" of the story. Now, I'm someone who goes into the iceberg principle-- know all that stuff that's under the surface, most of which you never see. Part of how I do that is starting with a Big Picture. First off is the map. I've been fine-tuning and updating the map. This below is still a work in progress-- the pure size of the work file means now I can only do a little bit at a time before things come to a grinding halt. I'm still in the process of adding names of cities and smaller bodies of water. But this gives you a sense of the larger world around the city of Maradaine. Now, I'll fully acknowledge that this world started out top-down. However, my process of research and thinking about bottom-up has allowed me to enrich where I was deficient. Also, I wanted to get a solid grasp of the journey of the whole world. 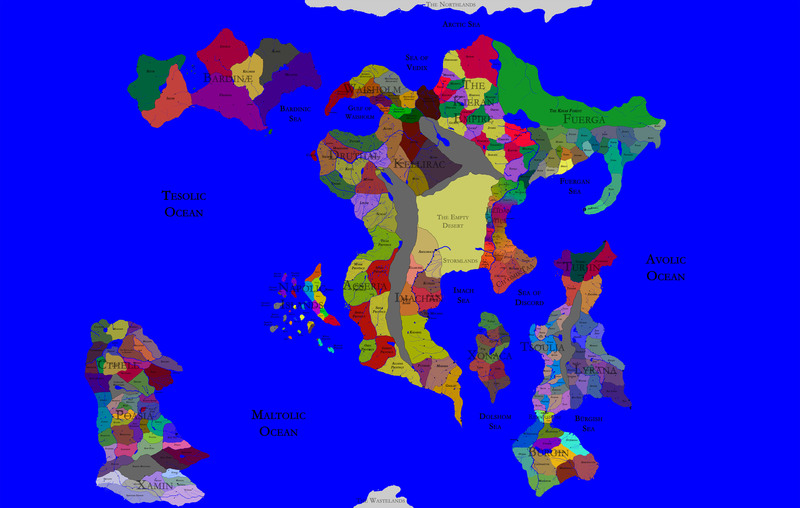 I've talked before about how in worldbuilding, history needs to be a process of change. Your world isn't going to be the same place a thousand years ago that it is now. There isn't necessarily going to be the One Big Event that makes everything how it is now. The things on one side of the world may or may not touch events on the others. So, I wanted to create another "big picture". A snapshot of the whole history of the world, to know the path so I can work the larger details. One final reminder-- the registration deadline for the ArmadilloCon Writers' Workshop is JUNE 15th! If you are in Austin (or can get there easily), it's very worth your while.